[147 Pages Report] The High Speed Steels Market is projected to grow from USD 2.13 Billion in 2016 to USD 2.77 Billion by 2021, at a CAGR of 5.3% between 2016 and 2021. For company profiles, 2016 has been considered as the base year. In the cases, wherein information was unavailable for the base year, the years prior to it have been considered. The ecosystem of the high speed steels includes raw material suppliers and manufacturers of high speed steels. Hudson Tool Steel Corporation (U.S.), Sandvik Materials Technology AB (Sweden), Erasteel (France), Nachi-Fujikoshi Corporation (Japan), Daido Steel Co., Ltd. (Japan), Friedr. Lohmann GmbH (Germany), Kennametal Inc. (U.S.), Voestalpine AG (Austria), ArcelorMittal S.A. (Luxembourg), and ThyssenKrupp AG (Germany), among others, are the key players operating in the high speed steels market. The products manufactured by these companies are used in the automotive, plastics, aerospace, and energy sectors. Scope of the Report: This research report categorizes the high speed steels market on the basis of product type, end-use industry, and region. 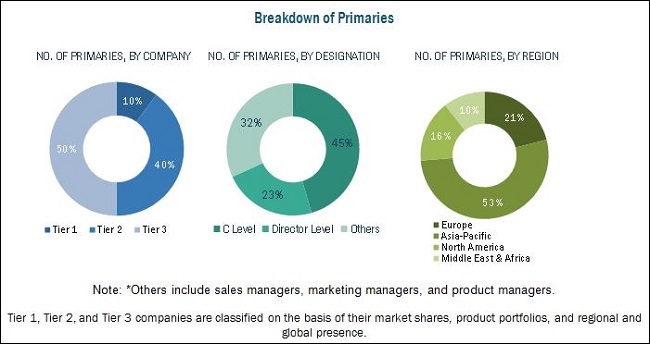 The report forecasts revenues as well as analyzes the trends in each of these submarkets. 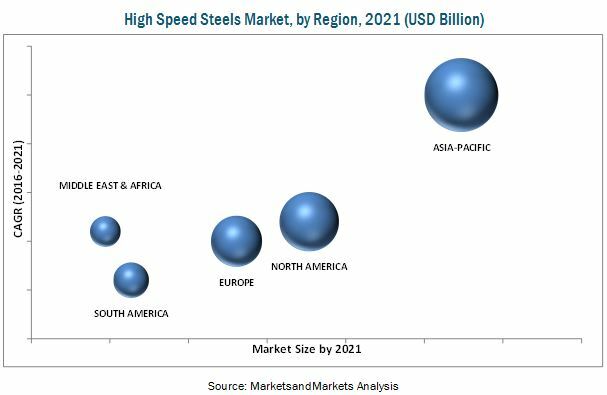 The high speed steels market is projected to grow from USD 2.13 Billion in 2016 to USD 2.77 Billion by 2021, at a CAGR of 5.3% between 2016 and 2021. Increasing demand for machinery made of high speed steels from various end-use industries, such as automotive, aerospace, and plastic, among others, is expected to drive the demand for high speed steels, thereby fueling the growth of the high speed steels market during the forecast period. Among product types, the metal cutting tools segment of the high speed steels market is projected to grow at the highest CAGR during the forecast period, 2016 to 2021. The growth of this segment can be attributed to the fact that metal cutting tools made from high speed steels ensure effective manufacturing of critical and complex components with ease and utmost accuracy. Among end-use industries, the automotive industry segment is projected to lead the high speed steels market during the forecast period. The growth of the automotive industry segment of the high speed steels market can be attributed to increasing demand for high-end industrial machinery and equipment from the automotive industry. High speed steels are widely used in the manufacturing of spare parts and components of railways and of passenger and commercial vehicles, owing to various properties offered by them, which include high strength, increased hardness, and high resistance to wearing and abrasion. The Asia-Pacific high speed steels market is projected to grow at the highest CAGR during the forecast period, 2016 to 2021. The region is a major consumer of high speed steels, which are used in varied end-use industries, such as automotive, plastic, and aerospace, among others. The demand for high speed steels is increasing in various countries, such as Japan, China, India, and South Korea, among others of the Asia-Pacific region. In order to meet this growing demand for high speed steels, top manufacturers of high speed steels from the U.S. and Europe are focusing on the Asia-Pacific region to expand their businesses. Lack of investments for carrying out R&D activities in the field of high speed steels and increasing use of carbide-based cutting tools in various end-use industries are expected to act as restraints for the growth of the high speed steels market during the forecast period. Hudson Tool Steel Corporation (U.S.), Sandvik Materials Technology AB (Sweden), Erasteel (France), Nachi-Fujikoshi Corporation (Japan), Daido Steel Co., Ltd. (Japan), Friedr. Lohmann GmbH (Germany), Kennametal Inc. (U.S.), Voestalpine AG (Austria), ArcelorMittal S.A. (Luxembourg), and ThyssenKrupp AG (Germany), among others, are the key companies operating in the high speed steels market. These players, with a wide market reach and established distribution networks, are investing increasingly in research & development activities for development of new grades of high speed steels. They also have strong technical and market development capabilities, which enable them to upgrade their existing products for new applications. 11.11 Tiangong International Co., Ltd.
11.13 Heye Special Steel Co., Ltd.
11.14 Nippon Koshuha Steel Co., Ltd.
11.23 West Yorkshire Steel Co. Ltd.
11.24 Big Kaiser Precision Tooling Inc.